﻿This recipe made the cover of the latest issue of Cooking Light. 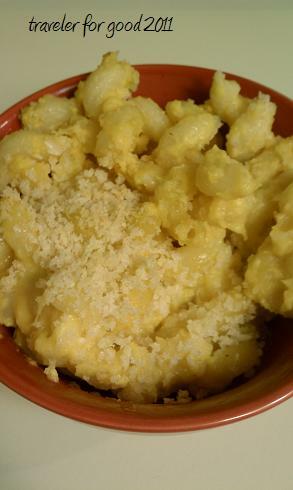 In general, I don't seek out Mac & Cheese recipes, but I was intrigued that this recipe uses butternut squash to create a "Bechamel" sauce - along with different cheeses and skim milk to get the gooey cheesy feel that normally comes from fattier cheeses and cream. It's bonus mac: It contains the hidden vegetable. Plus it gave me an excuse to go to Whole Foods to pick up the fancier cheeses (and a couple snacks....naturally). The recipe calls for Gruyere, but Chris, the friendly cheese expert, recommended I try Comte instead. It's made across the valley from Gruyere in smaller batches. I feel like I'm supporting the underdog of fancy French cheeses. À votre santé. Preheat oven to 375. Combine squash, broth, milk and garlic in a medium saucepan; bring to a boil over medium-high heat. Reduce heat to medium, and simmer until squash is tender, about 25 minutes. Remove from heat. Place hot squash mixture in a blender. Add salt, pepper and yogurt. Remove the center piece of the lid to allow steam to escape (but cover with a towel or there will be pureed squash everywhere). Blend until smooth. Place squash mix in a bowl; stir in Gruyever, Romano and 2 tablespoons Parmigiano cheese. Stir until combined. Cook pasta according to package directions (no salt or fat); drain well. Add pasta to squash mix and stir until combined. Spread into an 13 x 9 glass dish coated with cooking spray. Heat oil in a medium skilled over medium heat. Add panko, and cook for 2 minutes or until golden brown. Remove from heat; stir in remaining 2 tablespoons of Parmiagiano. Sprinkle evenly over the hote pasta mixture. Lightly coat topping with cooking spray. Bake at 375 for 25 minutes or until bubbly. Eat until full.